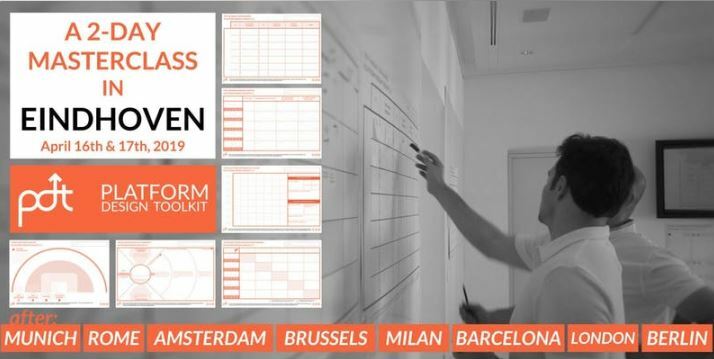 A 2-day experience to learn the Platform Design Toolkit, the most comprehensive set of strategy design tools for crafting and implementing platform strategies, used by YC-startups, Fortune500s, the UN, and thousands of SMBs, entrepreneurs and innovation agencies around the world. The methodology can be used for Business Model Innovation, rethinking entire industries, mobilizing ecosystems of partnerships, creating new marketplaces, platform infrastructures, API systems. It’s equally appealing to startups, scaleups, corporations, and institutions. Come individually or as a team, working on your own project case (a new product, innovating an existing offering, exploring the potential of a given market). Among the companies/orgs that use the methodology, we feature ING Bank, ABN Amro, Farfetch, SAP, Deutsche Bahn, Thales Group, Societè Generale, La Poste, United Nations, Decathlon, Groupe Adeo, Nokia / Bell Labs and many more. The typical target participant is: – Corporate managers (innovation, marketing, strategy, PMs) and their teams – Startups/Scaleups – Digital Agencies and Consulting.